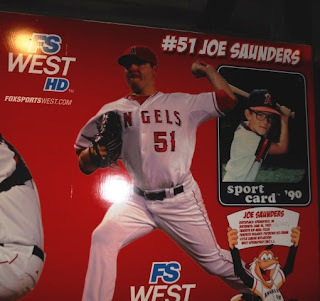 Roaming around at Angel Stadium on Monday, the day after the Angels' traded Saunders and prospects to the Arizona Diamondbacks for Dan Haren - the Saunders display had already disappeared. While Saunders was a 'bulldog' at times in his career for the Halos - it seems like he was more of a No. 3 or No. 4 guy and maybe it was a little disappointing to watch him struggle for periods of time. Several years ago, I printed out an Wallpaper image of Saunders at Virginia Tech on 4x6 photo paper - I was finally able to get Saunders to sign it this past spring training. Former Major Leaguer Shawn Green was another guy whose autographs I got at the 2010 All-Star Fan Fest in Anaheim - he made two appearances at the Fox sports West booth, but while I'm sure I brought particular set cards the first day he made an appearance, my visit to the All-Star Fan Fest was 'cut short' and must have put the cards somewhere to be forgotten. On the second day Green was signing - I was rummaging through my stuff to see if I had the various setters I had brought the other day, but the cards were nowhere to be found. I decided I wanted to get Green's autograph on something anyway - just so I could say I got him and add to my totals for the day, even though it wasn't on the setters I had intended on getting signed. Collectors and autograph hounds are very particular on the things they want autograph - maybe the worst are the guys [like myself I guess] who need to get particular cards signed, because the process over getting a little piece of cardboard signed becomes an obsession. I need a card or two from the Allen and Ginter's sets signed or from the 2004 Upper Deck USA 25th Anniversary set -as I try to get as many base cards from a particular set signed, I can't just have any old card signed. There is also a premium to getting set cards signed by retired players - since a number of them disappear from the spotlight after their playing careers are over. 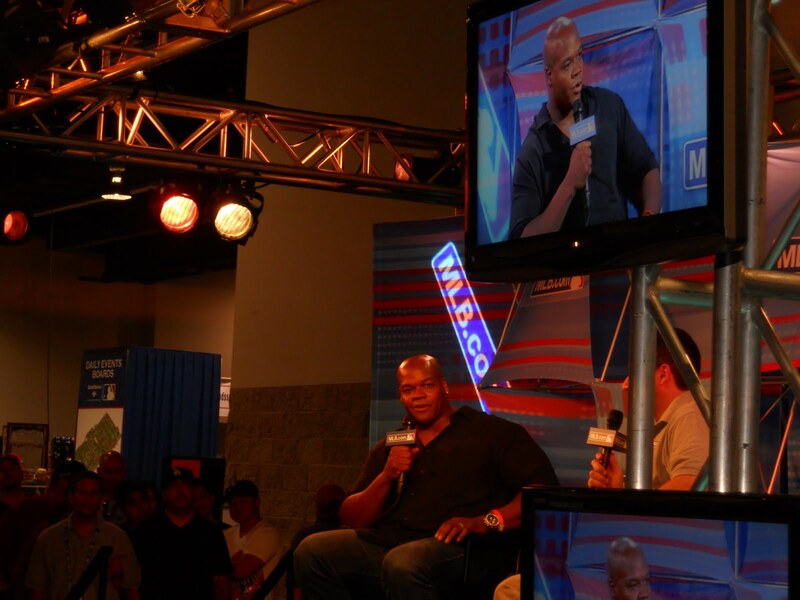 I hurriedly ran to the baseball card dealer booth [where I got the Frank Thomas cards from the previous post] and was bent on looking for Green's cards - one of the guys at the booth was like, "hey what are you looking for? You look like [you are on a mission to find something] - ah, Shawn Green." 2004 Leaf Certified Cuts Stars #S-32 / serial #'d 278/599 - I actually had to pay $2 for this, since it was marked as such on the penny sleeve. Green 2/2 - after giving my name to be put on a list and waiting in line, I finally had a chance to approach him and he scribbled on both of my cards. It looks like they turned out fine with no streaking, no bubbling, etc. Unlike the Thomas signing, this was an organized signing and there was a MLB authenticator to put a sticker on the back of my cards after they were signed - after the sticker is placed, the authenticator marks on a sheet, what type of item signed the stickers went on. 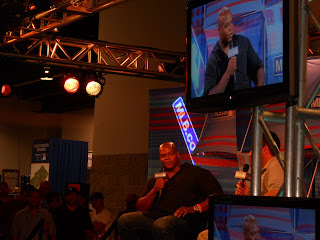 Frank Thomas 1/2 - walking around at the 2010 MLB All-Star Fan Fest in Anaheim, I saw the two-time AL MVP winner at the MLB.com booth / taping area and watched intently as he did an interview on stage. I have various things [particular set cards I want signed, about eight or nine poster-sized 'cards' I bought six or seven years ago on eBay] at home, but wasn't aware he was making an appearance at the fan fest - I ran to a baseball card dealer booth and tried to squeeze in-between a man and woman leafing through monster boxes of cards to grab a handful of Thomas cards. I was looking for 'setters,' but couldn't find any - I ended up picking up a couple of Thomas' rookie cards [paid $2 for the 1990 Topps and $1 for the 1990 Score], hoping to get him after his interview time was up. An acquaintance asked Thomas about his 1990 Topps 'No Name on Front' error card - Thomas wasn't really aware of of the controversy of the 'NNOF' error card and was straining to answer the question other than to guess that was his rookie card. Afterwards, it was a madhouse to get Thomas with 40-50 people following after him, just to try and get an autograph - he was signing, but it was difficult trying to get his attention, while watching weary security guards trying to shield him [in vain] from everyone who wanted an autograph and guide him out of the hall of the Anaheim Convention Center. I tried to find an opening and one barely opened up - where Thomas grabbed my clipboard and signed the Topps card. Even though I was excited about All-Star break in Anaheim - I didn't bother with the events people cared about like the Home Run Derby [maybe $60 or so for a ticket to get into Angel Stadium] and the actual All-Star Game [maybe $150 for a ticket to get into Angel Stadium]. It seemed easy to 'whiff' on these events, because when I'm wired to look for autographs - paying $60-$150 for tickets just to be a 'non-VIP' spectator is just isn't going to cut it. I did spend time at the Futures Game / Taco Bell Celebrity / Legends softball game[$20 for a ticket] the Sunday before the game was played and got a handful of prospects' autographs there including players like Mike Moustakas [U.S.A.], Eric Hosmer [U.S.A.] and Brett Lawrie [World] - though I didn't bother to get Angels' uber prospect Mike Trout and eventual game MVP Hank Conger. I was able to also snag Jennie Finch's autograph as well as Fred Lynn's - even though I failed to account for the fact Mike Piazza was going to be around. My goal as far as picking up autographs of the active players was to get some 'big fish' along the way - I wasn't not going to try and make it a goose chase with no results to show for the huffing and puffing. In the end, I didn't get much, but the following players signed and I was able to get them. Marlon Byrd (2) - was able to get him twice. Trevor Cahill 3/3 - signed three cards at one time. Troy Tulowitzki (1) - my best success from an active player during the A.S. break, this was totally a fluke. The item he signed was actually a 6x8 sized 2007 Topps Turkey Red Cabinet. Vernon Wells 2/2, 2/2 - he signed a bunch and was able to get him on two cards, two different times.